What is up lately with the retro vibe lately? We found out that retro is the new word for cool hipster. Everyone wants to be retro. Even if you’re a celebrity you want to pretend like you’re homeless. Because in 2015 homeless people are the coolest retro thing ever. So what do you need to do when you’re not really homeless but you still want to join the overwhelming hipster crowd? 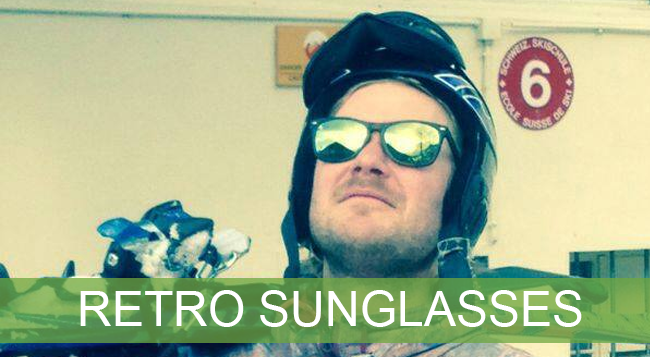 Just order a pair of retro sunglasses online at our website. Yes, it’s that easy. We have such a large incredible collection of retro shizzle, you’re hipster heart will skip a beat. Buy one of these retro beauties online, don’t shower for at least a week, go to a festival like Coachella or anything in that direction and you’re going to be on top of the retro world. Success guaranteed! Back in the days, people thought that the earth wasn’t round. No they thought it was as flat as a cup of butter. Strange huh? Luckily we found out that the earth definitely is round. That’s why we created some übercool round sunglasses. We have retro babies in all shapes and sizes, you can eat your fashionable heart out. Go rock your superstylish outfit and add a finishing shine with some old skool round sunglasses or go arty farty for chunky frames. Whatever you want, we have it all in store for you. Go explore your inner boho-chic beauty and get yourself a pair of these really remarkable round retro rrrrrsunglasses. As we all know we live in 2019 and we see ourselves as modern people. This means we have the ability to use The Internet and order products online – yay. At www.cheapasssunglasses.com you can buy a lot of top notch sunglasses because they’re reeeeally low-priced just the way you like it. At the cheapass sunglasses headquarters where the big bosses work, everyone is so fashion minded and driven (or you can also say OBSESSED) with the latest trends that you will get the hippest sunglasses for sho. No need to worry ‘bout that. In the meantime that we’re staying super focused, you can sit back, relax and enjoy the ride on our website. A little note to add on this wonderful story; if you purchase your sunglasses right now as we speak, you’re going to have them on your head tomorrow. Isn’t that great? Yes? We thought so already. One word: GO!